Sincere thanks to Kenro Industries for loaning me the DC Comics™ pen reviewed here. 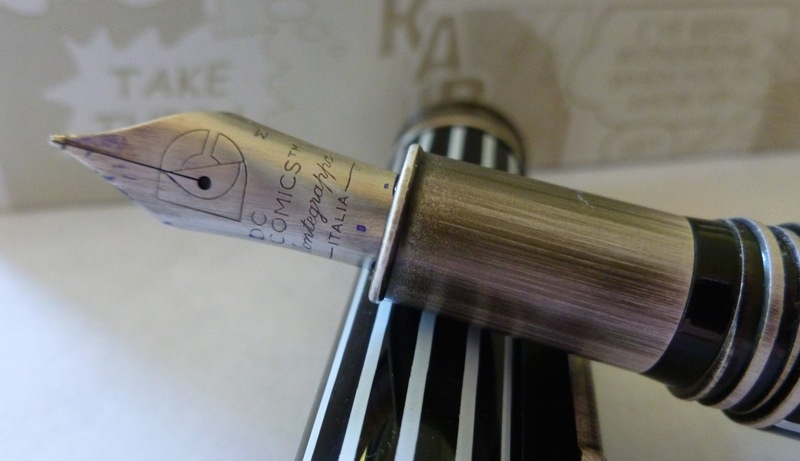 The pen will be returned to them while I’ll be keeping the open bottle of ink as well as a pad of Montegrappa paper. I was not monetarily compensated, and there are no affiliate links. 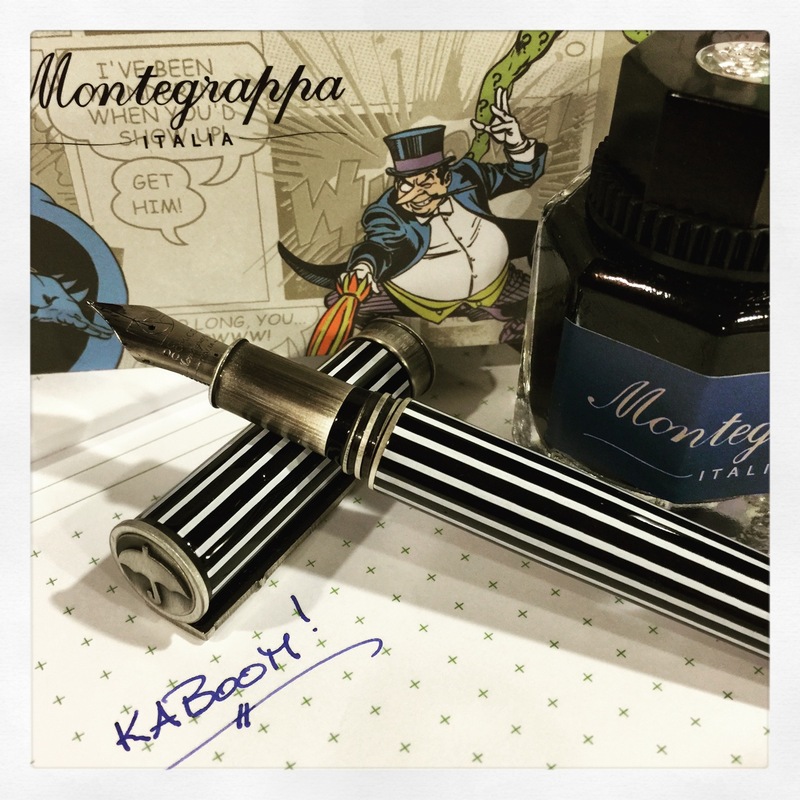 I’ve had a blast using Montegrappa’s DC Comics™ Penguin fountain pen and am happy to share my thoughts and experiences with you. The year is 1966. I’m seven years old and sitting in our basement playroom on a perfectly sunny day. Despite parental pleading (i.e., YELLING) to go outside and play, I sit glued to the TV, worried, yet again, about the fate of my beloved Batman. He’s in another cliff-hanger situation, knocked unconscious by a cloud of poison emitted from the tip of the Penguin’s umbrella. I fear that he may never wake up. (I’m a second-grader, and don’t yet understand the manipulative ways of TV.) So I fret, until the next episode, where Batman springs back to life, once again ready to defend Gotham City. 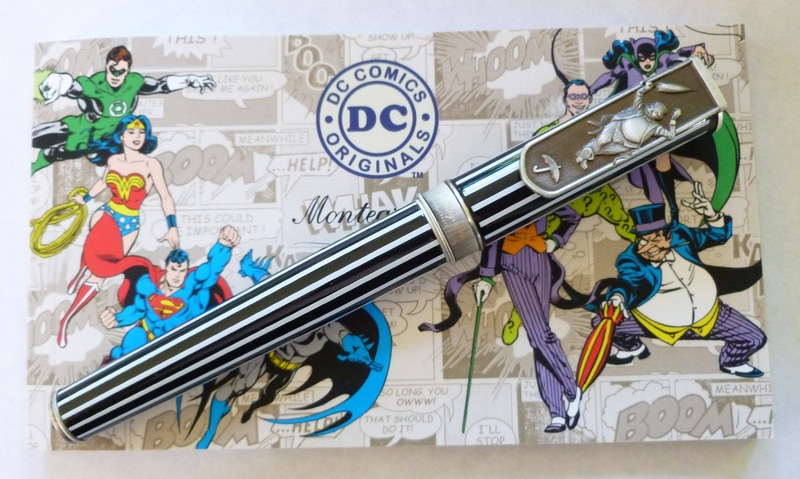 Montegrappa brings back all of those childhood memories with its DC Comics™ Penguin Fountain Pen. 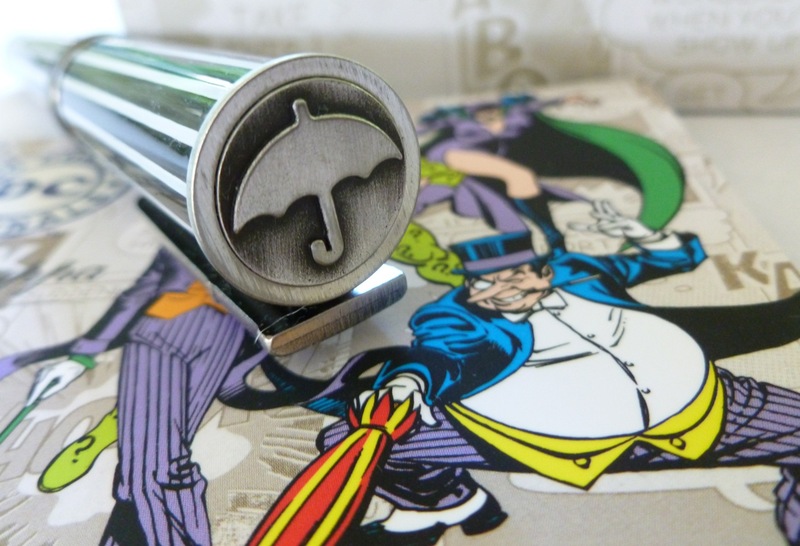 One of the series of four villains (Joker, Riddler, Penguin, Cat Woman) and Heroes (Batman, Superman, Wonder Woman, Green Lantern), the Penguin fountain pen is full of evocative details. The pen is solid brass and sports a thick, pin-striped lacquer finish that perfectly captures the Penguin’s iconic trousers. The Penguin’s umbrella served him well as he waged war on Batman and Gotham City. In addition to spewing out knockout gas, the umbrella was used as a parachute, and to inflict pain with its razor sharp tip. You’ll find the Penguin’s notorious accessory on the end of the pen’s cap, and twice on the pen’s flat, broad clip—once in the right hand of our villain and again at the bottom of the clip. 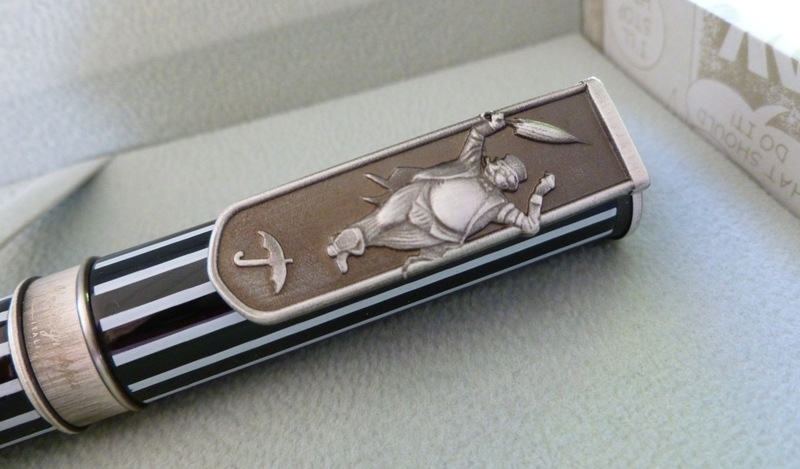 The substantial, spring-loaded clip matches the heft of the pen, and features a relief of a celebratory Penguin. Capped, the Penguin pen weighs in at a beefy 57 grams. Even uncapped, this is a weighty pen (31 g), and to be honest, I thought the heaviness would put me off. Surprisingly, though, I found that the heftiness of the pen was actually an advantage as I barely had to press the nib to paper when writing. The weight of the pen did the work for me. Balance is very good so I experienced no hand fatigue while writing with the pen (and I’m no weight-lifter!). Posting the snap cap (26 g), on the other hand, makes the pen far too top heavy, so using the pen unposted really is a must. Maybe it’s my imagination, but I feel like the well-tuned nib coupled with the pen’s weight make my handwriting better than usual. I really was surprised at how comfortable and effortless this pen feels in hand. 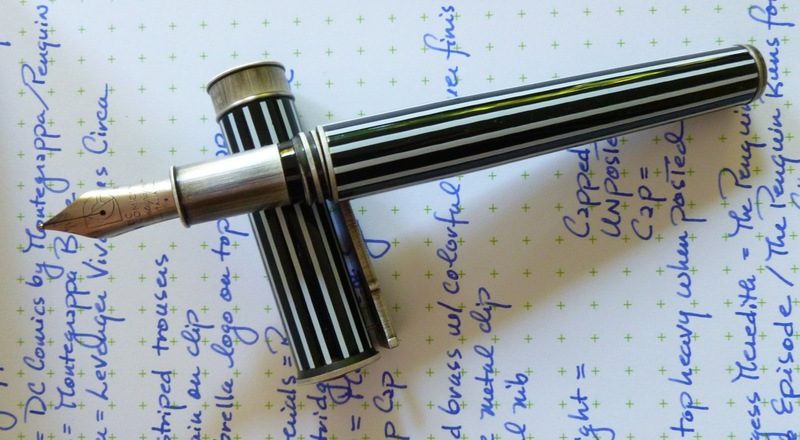 This is the first Montegrappa pen I’ve used and it’s been a great experience. While I thought this Penguin pen would be fun but not for me, I quickly changed my mind when the nib hit the page. This is a heavyweight writer that can handle serious work with a light-hearted touch. Life can be rough, but after a few strokes of the pen—KABOOM!—my stress disappeared for awhile. 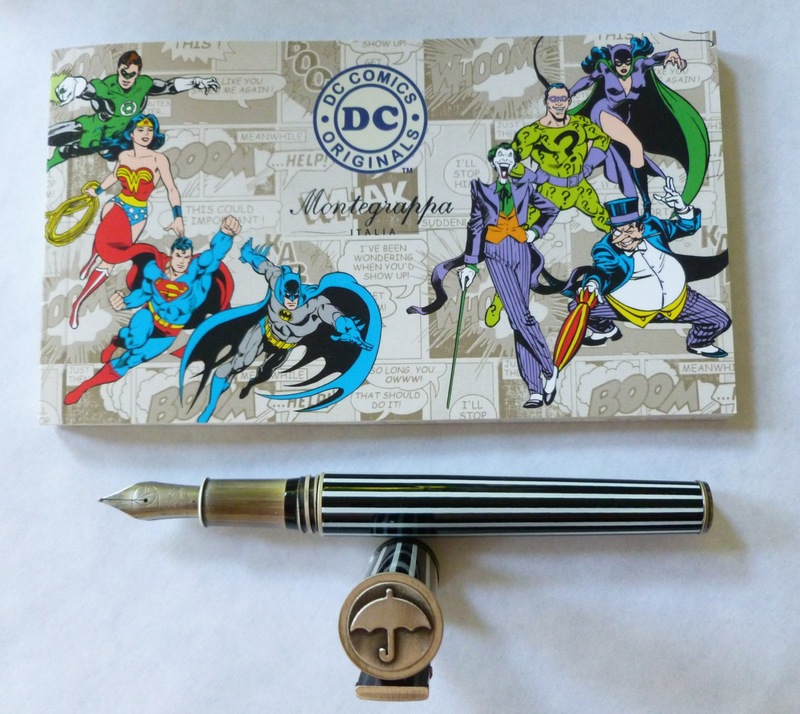 Montegrappa’s DC Comics™ Penguin fountain pen reminds me of those simpler childhood days, where my only worry was Batman’s ability to save himself from the poisonous attacks of the Penguin. That’s a feat more impressive than any of the Penguin’s diabolical umbrella tricks. You can explore the full line of Montegrappa’s DC Comics™ fountain pens, ballpoints, and rollerballs at Fountain Pen Hospital.